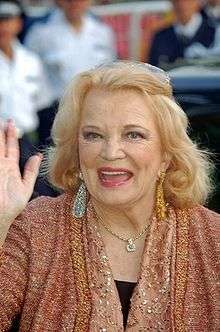 Virginia Cathryn "Gena" Rowlands (born June 19, 1930) is an American film, stage, and television actress, whose career in the entertainment industry has spanned over six decades. A four-time Emmy and two-time Golden Globe winner, she is known for her collaborations with her late actor-director husband John Cassavetes in ten films, including A Woman Under the Influence (1974) and Gloria (1980), which earned her nominations for the Academy Award for Best Actress. She also won the Silver Bear for Best Actress for Opening Night (1977). In November 2015, Rowlands received an Honorary Academy Award in recognition of her unique screen performances. Rowlands was born as Virginia Cathryn Rowlands in Madison, Wisconsin. Her mother, Mary Allen (Neal), was a housewife who later worked as an actress under the stage name Lady Rowlands. Her father, Edwin Myrwyn Rowlands, was a banker and state legislator. He was a member of the Wisconsin Progressive Party, and was of Welsh descent. She had a brother, David Rowlands. Her family moved to Washington, D.C., in 1939, when Edwin was appointed to a position in the United States Department of Agriculture; moved to Milwaukee, Wisconsin, in 1942, when he was appointed as branch manager of the Office of Price Administration; and later moved to Minneapolis, Minnesota. From 1947–50, she attended the University of Wisconsin, where she was a popular student already renowned for her beauty. She left for New York City to study drama at the American Academy of Dramatic Arts. In the early 1950s, Rowlands performed with repertory theatre companies and at the Provincetown Playhouse. She made her Broadway debut in The Seven Year Itch and toured in a national production of the play. Rowlands costarred with Paul Stewart in the 26-episode syndicated TV series Top Secret (1954–55), and she guest starred on such anthology television series as Robert Montgomery Presents, Appointment with Adventure, Kraft Television Theatre, and Studio One (1955). In 1956, she starred in Middle of the Night opposite Edward G. Robinson. She appeared alongside husband Cassavetes on an episode ("Fly Baby, Fly") of the 1959–60 NBC detective series Johnny Staccato. She also appeared on an episode of the NBC western series, Riverboat, starring Darren McGavin, and the ABC adventure series, The Islanders, set in the South Pacific. Rowlands made her film debut in The High Cost of Loving in 1958. In 1961–62, she starred as Teddy Carella, the deaf-mute wife of Robert Lansing, on NBC's 87th Precinct. In that same season, she appeared on ABC's Target: The Corruptors!, starring Stephen McNally. She also guest starred in CBS's The Lloyd Bridges Show and ABC's Breaking Point. In 1963, she guest-starred in an episode on the NBC western series, Bonanza and The Virginian, and "The Lonely Hours" and "Ride The Nightmare" on CBS's The Alfred Hitchcock Hour. In 1967, she was cast as socialite Adrienne Van Leyden in the prime time ABC soap opera Peyton Place. Rowlands has been nominated for two Academy Awards, eight Emmy Awards, one Daytime Emmy, eight Golden Globes, three Satellite Awards, and one SAG Award. Some of her notable wins include a Silver Bear for Best Actress; three Emmy Awards and one Daytime Emmy; two Golden Globes; two National Board of Review Awards; two Satellite Awards; and one Prize San Sebastián. In January 2015, Rowlands was presented with a lifetime achievement award by the Los Angeles Film Critics Association  At the 2015 Governors Awards she received an Honorary Academy Award. The press release described Rowland as "an original talent" whose "devotion to her craft has earned her worldwide recognition as an independent film icon". ↑ Tim Gray. "Gena Rowlands, Spike Lee, Debbie Reynolds to Receive Governors Awards Oscars". Variety. ↑ "Gena Rowlands Biography (1930?-)". ↑ Lane, Lydia (November 21, 1980). "Beauty". ↑ Registrar's Office, University of Wisconsin–Madison. ↑ "Top Secret". Classic TV Archive. Retrieved 2014-11-26. ↑ "Another Woman". Time Out. Retrieved April 1, 2013. ↑ "Another Woman". Film4. Retrieved April 1, 2013. ↑ Ebert, Roger (November 18, 1988). "Another Woman". Chicago Sun-Times. Retrieved April 1, 2013. ↑ Chang, Justin (16 December 2014). "Film Review: 'Six Dance Lessons in Six Weeks'". Variety. Retrieved 29 September 2016. ↑ "The Hollywood Reporter Interview with Gena Rowlands". March 29, 2015. ↑ "LAFCA Lifetime Achievement Award". March 29, 2015. ↑ "Spike Lee, Debbie Reynolds And Gena Rowlands To Receive Academy's 2015 Governors Awards". AMPAS. Retrieved 5 November 2015. ↑ "Berlinale 1978: Prize Winners". berlinale.de. Retrieved 2010-08-08.